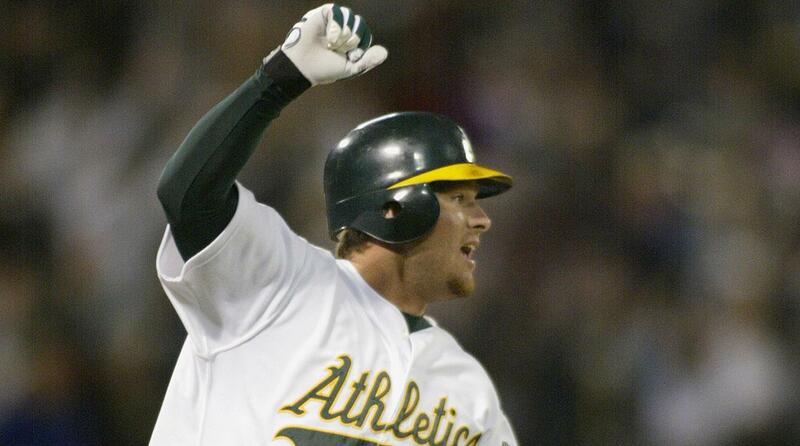 Scott Hatteberg celebrates his walk-off homer which gave the A’s their 20th consecutive win on 9/4/02. My friend texted me the other day and asked me how I felt about the Cleveland Indians challenging the Oakland Athletics’ American League record of 20 straight wins set back in 2002. It was a scenario I was very well aware of anytime a team reaches double digits in a winning streak. Many teams since 2002 have reached that plateau but no team has come close to eclipsing the record set by my favorite team. Until the Indians. On Monday night, the Indians dominated the toothless Detroit Tigers 11-0 to win their 19th game in a row. One more today and they tie the A’s for the American League record. The Indians are my favorite to win the World Series this year. I have a soft spot for the team and since high school, I adopted them as my second favorite baseball team. My friend also wants to see them win it all this year. And that’s what I hope is the end result for the team this year. But please, Indians, don’t win 20 games in a row. In 2002, the Oakland Athletics were coming off their second consecutive early playoff exit and were trying to find a way to make it back after losing Jason Giambi in free agency to the New York Yankees. The A’s have always been the little engine that could in baseball. Their small payroll made their rise to the top among playoff teams was impressive. The squad was led by Tim Hudson, Mark Mulder and Barry Zito (who would win the Cy Young Award that season) as the core of their impressive pitching rotation. Eric Chavez was their budding young star third baseman and new team leader Miguel Tejada would put together a season that would earn him MVP honors. The team was a good team. Much like the Indians right now, that team had World Series aspirations. But that’s where the comparisons start to split along the road. Oakland was coming off another early playoff exit while the Indians were just in the World Series the year before and almost won the whole thing. The A’s had to recover from losing their biggest star in slugger Giambi. The Indians added a slugger in Edwin Encarnacion to their lineup. Both these teams were good, but only one of these teams you would expect to dominate to the point where they could win 20 consecutive games. I grew up an Oakland A’s fan and that 20-game winning streak meant a lot for a franchise that had so much hope and potential. There was so much drama during the winning streak. The 1-0 shutout by Cory Lidle and the pen against Mark Buehrle was impressive. The comeback in the 12th win against Detroit was like pulling a rabbit out of the hat. And of course the final three victories were all capped off by walk-off hits, including two from Tejada and the final from pinch-hitter Scott Hatteberg, saving the A’s from an embarrassing story of squandering an 11-0 lead. This win streak for the Athletics was the highlight of a season that saw the team falter in the playoffs once again. But it was because of the drama and the unlikely heroes of the streak (and season) that made this so special to baseball lore. They wrote a book about this season. They turned that book into a movie featuring Brad Pitt, Jonah Hill and Chris Pratt. This streak — this story — is so special that I don’t want to see its mystique go away. And that’s what the Indians are trying to do. Their win streak of 19 games so far is of a different kind of storytelling. Rather than crazy comeback victories and shocking walk-off hits, the Indians have scored first in 18 of their 19 games during the streak. Their pitching has been dominant, which includes six shutouts (and their rotation has a 1.84 ERA). The Indians have outscored their opponents 132-32 (and have hit 38 homers as well). This win streak is that of dominance. On Tuesday they will send Corey Kluber (who could win his second Cy Young Award this season) against the hapless Tigers. That’s not to say the A’s didn’t have their fair share of dominant performances during their streak either. But it was not an easy streak. There were games where it was close with four one-run games and a handful of comebacks as well. Simply put, these two win streaks offer two types of narratives for the story line of baseball history. You have one team that had some ups and downs and turned an improbable situation into a win streak full of drama. The other team’s streak is that of a well-oiled machine from a roster so dominant that itself is impressive in perspective of baseball history. Both are great streaks and special in their own way. But I do not want the Indians to reach 20. I want the narrative of the little engine to continue on. The Indians can have their very likely World Series glory. They don’t need this record-tying win streak. Let the A’s have this record. Their 20-game journey was full of unbelievable magic. It is a much more special story to tell. A story that should live on for a little bit longer. This entry was posted in Cleveland Indians, Column, MLB, Oakland Athletics and tagged 20-game win streak, Moneyball. Bookmark the permalink.